Starting today, EVE Online players can stream corporate transactions and massive space battles without using an external program. As a gamer who once waited impatiently for friends to finish their turn of Super Mario Bros., I've never entirely understood the appeal of only watching someone play videogames. Nonetheless, there's actually a huge market for it these days. Many popular games currently support integrated Twitch streaming, while the PS4 recorded 38 years of footage alone. Now EVE Online, CCP's long-running MMO of corporate management and economy-destroying space combat, will also get into the streaming game. Starting today, all EVE members can forward live feeds directly to their Twitch accounts, saving the trouble of using any cumbersome third-party programs. By default, Twitch options are located under the Neocom root menu, but they can be dragged into the Neocome bar for easy access. Outside of simply streaming footage, EVE's Twitch interface lets you choose the feed's title, resolution, and frame rate before the feed goes live. Unfortunately, EVE's Twitch functionality only works for PC players at this time. 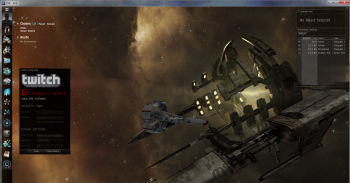 CCP is investigating a fix for Mac users, but it won't be ready for today's launch. Outside of generating interest for EVE Online, Twitch feeds should prove exciting for viewers and players alike. Game streaming already attracts wide audiences to MMOs and online games, especially when the lucrative tournament season rolls around. Also, since EVE Online is an incredibly complex MMO, new players could benefit by watching feeds to become familiar with the game. That being said, player CEOs should probably be set their Twitch streams to private, on the off chance they divulge corporate secrets to the entire internet.